What Is A Torchdown Roofing System, Is It Best For My Home In Seattle? What Is A Torchdown Roofing System? There are many choices and material types you can use on your flat roofing system in Seattle. Single ply membranes such as PVC, EPDM, TPO or torchdown are the most common low slope roofing materials. Depending on your roofing systems design one of these membranes might be a better choice than the other. In this consumer education article I would like to shed some light on torchdown roofing systems. Chase NW has been installing torchdown as a Seattle roofing contractor for over a decade. The typical standard material warranty for a torchdown roofing system is 10 years and up to 20 years with upgraded system specifications. “No dollar limit” warranties are available on torchdown roofing systems through certified roofing contractors. No dollar limit warranties must be installed to exact upgraded commercial specifications and inspected by the manufacturer with a passing grade. The manufacturer then guarantees not only the material but also the workmanship of the contractor for an X amount of time with a 100% guarantee. 90% complete on a 160 square torchdown re-roof with silvercoat near Seattle, Washington. Torchdown is applied by an open flame. It comes in rolls of 1 roofing square and can easy be rolled out across the roof. The entire width of the membrane is to be heated adhering the whole roll to the sub deck or existing roof in the case of a recover. An error often made is for a contractor to only heat the seams of the modified Bitumen leaving the remainder of the membrane laying loose on the roof deck. This compromises the integrity of the waterproofing ability as the seams over time are the first aspect of the membrane that will fail due to weatherization. Due to its application it should be installed by an experienced roofer. Insurance is required to install torchdown which ensures the safety of both the home owner and contractor. 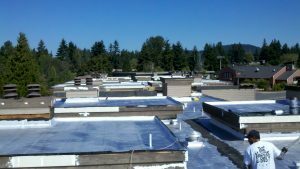 Before you consider utilizing torchdown please contact a local Seattle roofing contractor and get a professional consultation to make sure its best for your roof system. We recommend following the National Roofing Contractor’s Association (NRCA) regulations for applying torchdown. Contact us and we will get back to you quickly with an effective and affordable solution for your roofing needs. Don’t take our word for it! Please see what our past customers have said about us on Google Places! Next What is single ply roofing membrane, is it right for my home in Seattle? Very nice post. Thanks for sharing this new techniques of torch down roofing. 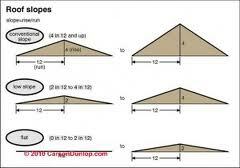 This is really helpful for roofing Colorado springs. This post shows a very good idea for all homeowners and builders. I thought this was something that would effect harm to the environment but based on what you have posted it seems very good and will surely build a sturdy house. I personally do all of my work in the North Texas areas. When I have a low-slope project I always recomend the torch down method primarily do to the extreme weather changes that we get. It gets to be extremely hot during the summer and gets as cold as any where else during the winter months. The rubber made material IS great for the contraction and expansion reasons for my area. It all depends on the home owners preference and budget. Torchdown, metal, and TPO would all make fine choices for a residential low-slope system.